The North Shore Health Department (NSHD) operates offices in both Brown Deer and Shorewood. At these sites, we offer appointment-based immunization and Adult Health Screening clinics, as well as regularly scheduled walk-in blood pressure screening clinics. Additionally, we offer a monthly immunization clinic at the North Shore Library (appointments are still necessary) as well as five other blood pressure clinics at locations throughout the North Shore. Besides these clinics, NSHD provides many other great services to you and your community. When we are not hosting a clinic or answering calls from the public, we can be found out in the community promoting and protecting the public’s health. We may be visiting a family with a newborn baby and offering lactation support. We may be collecting water samples at the beaches to test for E.coli levels. We could be hosting a fall prevention class at the senior center. We may be attending a conference to help us better prepare for a coordinated response to a public emergency. Or we may be completing a state mandated investigation on one of a variety of communicable diseases. Speaking of prevention, did you know that most flu is preventable? Diagnosed cases of influenza have dramatically increased over the last month in our region. The Wisconsin Department of Health Services believes that flu activity has not yet peaked in Wisconsin and that high influenza activity will continue well into April. The North Shore averaged one flu-associated hospitalization case each day last week (394 state wide) including patients of all age groups. Additionally, an area long term care facility had a small outbreak which was kept in check by mass vaccination in the Fall, early diagnosis, prophylactic treatment of the exposed with TamiFlu and quick isolation of the ill. The best way to prevent flu is to get the vaccination in the fall. However, it is not too late to receive the flu vaccine. It is still recommended if you are medically able. Even if you have been vaccinated, if you suspect you have the flu (sudden onset of fever, chills and cold-like symptoms accompanied by muscle aches), early diagnosis by a medical professional is essential as treatment to lessen symptoms is only provided within the first 48 hours. To learn more about flu, go to: https://www.cdc.gov/flu/index.htm or https://www.dhs.wisconsin.gov/influenza/index.htm. Suicide is the tenth leading cause of death in Wisconsin—four times higher than the rate of homicide. But it’s preventable. Prevent Suicide Wisconsin offers five action steps for helping someone in emotional pain. Death by suicide only captures part of the picture. For every suicide, there are approximately 11 hospitalizations or visits to the emergency department for self-inflicted injuries. If you or someone you know is in crisis, please contact the National Suicide Prevention Lifeline at: 1-800-273-8255. You may have seen a recent news story about the first child in the state of Oregon to contract Tetanus in the last 30 years. The United States has seen a 95% decline in tetanus cases and 99% in tetanus related deaths since the 1940s. This is largely due to the widespread use of the Tetanus vaccine and proper wound management. For this reason, tetanus is uncommon today, with only about 30 cases reported each year in the U.S. Nearly all of these cases occur in those who are unvaccinated. The bacteria that causes tetanus can be found almost anywhere in our environment, but especially in dust, soil, and manure. It usually enters through broken skin. The most common symptoms of the infection are tightening and spasms of the jaw muscles, which is why tetanus is often referred to as “lockjaw”. The healthcare costs to treat this disease can be astronomical. The boy in Oregon spent eight weeks in the hospital and his medical bills totaled more than $800,000. Check the immunization status of your child or yourself on the Wisconsin Immunization Registry (WIR) at https://www.dhswir.org/PR/clientSearch.do . March is National Nutrition Month! Nutrition is a key to better health. The North Shore Health Department recognizes the importance of good nutrition in its current (2015-19) Community Health Improvement Plan (accessible at https://www.nshealthdept.org in the “Reports” tab) as it relates to chronic disease prevention and control. In addition, our 2019-2023 Plan also includes Nutrition and Physical Activity as a priority area. The following nutrition tips are shared from the Academy of Nutrition and Dietetics. Eat Breakfast: Try a parfait of low-fat yogurt, fruit and whole grain cereal. Make Half Your Plate Fruits and Vegetables: Make 2 cups of fruit and 2 and ½ cups vegetables your daily goal. Experiment with different types-fresh, frozen and canned. Watch Portion Sizes. Get out the measuring cups and see how close your portions are to the recommended serving size. Drink More Water. Quench your thirst with water instead of drinks with added sugars. If you wait until you are thirsty to drink water, you may already be dehydrated. Enact Family Mealtime. Plan to eat as a family at least a few times each week. Turn off the TV and phones to encourage mealtime talk. Get the kids involved with meal planning and cooking and use this time to teach them about good nutrition. Slow Down at Mealtime. Don’t eat on the run. Try to sit down and focus on each bite. Dedicating time to enjoy the taste and textures of foods can positively affect your food intake. March is Brain Injury Awareness Month. Data currently suggests that traumatic brain injuries (TBI) are most likely to occur in children and adults over the age of 65. The Center for Disease Control and Prevention (CDC) defines a TBI as a disruption of normal brain function caused by a jolt, bump, blow, or penetration to the head. TBIs include concussions, contusions, penetration, or anoxic brain injuries. Concussions are a common type of TBI that can happen with physical activities such as sports. Helmets are important when riding a bicycle and playing summer sports such as football and lacrosse, but did you know that the U.S. Consumer Product Safety Commission (CPSC) and The American Academy of Pediatrics also recommend the use of protective helmets with winter sports? · Do wear a multi-sport helmet while ice skating, sledding, or playing hockey. · Don’t wear a multi-sport helmet while skiing or snowboarding. Do wear a helmet that is ASTM-certified (American Society for Testing Materials) for skiing and snowboarding. M is for no motion. V is for the “V” shape the straps make under your ears once fastened. P is for correct position of the helmet. · Don’t use a helmet that is expired. Getting ready for summer? We have $10 bike helmets available at both of our offices. Helmets are for children and the adults who ride with them—the only requirement is that we need to do a fitting for all of those who receive one. February is Teen Dating Violence Awareness and Prevention Month. Teen dating violence can be physical, emotional, or sexual, and includes stalking. It can occur in person or electronically, which includes texting, social media, and other online applications. In a recent national survey, 8% of high school students reported physical violence and 7% reported that they experienced sexual violence from a dating partner in the 12 months before the survey. According to the 2017 Wisconsin Youth Risk Behavior Survey data, almost 1 in 7 female students have been forced into a sexual activity. High school males also experience sexual violence, although at a lesser rate than their female counterparts. Highest rates are among students with physical disabilities, health issues and those who identify as lesbian, gay, bisexual, or transgender (LGBT). Unfortunately, the results of these experiences can be long lasting as these students are more likely to be depressed, anxious or suicidal. Nearly half of students who have attempted suicide have experienced dating violence. Victims of teen dating violence are also more likely to engage in unhealthy behaviors, such as using tobacco, drugs, and alcohol. Teens who are victims in high school are at higher risk for victimization during college and throughout their lifetimes. What can be done? Teens receive messages about how to behave in relationships from peers, adults, and the media. Often these examples suggest that violence in a relationship is normal, but teens need to be told that violence is never acceptable. It is important to teach healthy relationship skills by discussing and modeling respect, empathy and careful listening. Dating violence can be prevented when teens, families, organizations, and communities work together to implement effective prevention strategies. Although it’s still early in the year, some of us have already dropped our New Year’s Resolutions to quit smoking or drinking, to increase exercise or lose that extra weight. But, since February is National Cancer Prevention Month- it is a great time to renew those healthy goals as all of them also align with cancer prevention. Most people know that it is possible to reduce cancer risks by avoiding tobacco and tobacco products. But did you know that limiting alcohol also reduces the risks of liver, colorectal (colon), mouth and throat and female breast cancer? The risk actually increases with the number of drinks consumed! Being overweight (obesity) also increases the risk of 13 different types of cancer. Since increased exercise is an excellent way to help with weight control, getting more active can also help reduce the risk for associated cancers. Protecting skin from ultraviolet rays on that Spring Break trip is an important way to reduce the risk of deadly skin cancers. Slathering on sun block well before you hit the beach or pool deck will help protect skin that hasn’t seen the sun all winter. Along with making these healthy lifestyle choices, getting regular cancer screenings and vaccinations as recommended can be part of your plan for better health. Regular screening tests for breast, cervical, and colorectal (colon) cancers can find cancer early, when treatment works best. Grab an apple, take a walk and schedule a cancer screening test, if you are due. February is the perfect time to resurrect those healthy New Year’s resolutions! Current e-cigarette use, also known as vaping and Juuling, increased considerably among U.S. middle and high school students during 2017–2018. According to the most recent information from the National Youth Tobacco Survey, vaping among high school students nearly doubled from 12% in 2017 to 21% in 2018. Although e-cigarettes have the potential to benefit adult smokers if used as a complete substitute for combustible tobacco smoking, the use of any form of tobacco product among youth, including e-cigarettes, is unsafe. In 2018, the Surgeon General declared e-cigarette use and vaping among youth an epidemic because of the potential for nicotine addiction and other associated health risks caused by e-cigarettes. Additionally, e-cigarette devices are often used to deliver marijuana and other drugs to the user. Wisconsin State Statute makes it illegal for retailers to sell e-cigarettes with nicotine to anyone under the age of 18 years old. It is also illegal for anyone under the age of 18 to purchase or possess e-cigarettes with nicotine. While Wisconsin has a Clean Indoor Air law which bans smoking in all enclosed workplaces, including bars and restaurants, e-cigarette use/vaping is exempt from this law. Some local governments, including Milwaukee, have passed laws prohibiting e-cigarette use in enclosed workplaces. Measles has been in the news recently, as an outbreak in Washington State has risen to 50 cases. Measles is the leading cause of vaccine-preventable childhood mortality. In 2000, the United States declared measles eliminated from this country, which is defined as the absence of continuous disease transmission for 12 months. The United States eliminated measles because it has a highly effective measles vaccine, a strong vaccination program that achieves high vaccine coverage in children, and a strong public health system for detecting and responding to measles cases and outbreaks. However, measles still can occur in the US because of travel to countries where measles are endemic. Once introduced, measles can spread through communities with pockets of unvaccinated people, as is the case in Washington State. When measles gets into communities with pockets of unvaccinated people, outbreaks are more likely to occur. These communities make it difficult to control the spread of the disease and make us vulnerable to having the virus re-establish itself in our country. High sustained measles vaccine coverage and rapid public health response are critical for preventing and controlling measles cases and outbreaks. Local health departments, like the North Shore Health Department, follow up on all actual or suspected cases of measles, including completing contact investigations, issuing orders of quarantine, and assisting schools with calculating exclusion dates for unvaccinated children (for measles, through 21 days after the last exposure to a measles case). Children and adults are fully vaccinated if they have received two doses of MMR or MMRV. The first is usually given at 12-15 months and the second at 4-6 years. Check the immunization status of your child or yourself on the Wisconsin Immunization Registry (WIR) at https://www.dhswir.org/PR/clientSearch.do . During extreme cold, limit time outside. If you need to go outside, wear layers of warm clothing. Watch for signs of frostbite and hypothermia. Avoid carbon monoxide poisoning. Never heat your home with an oven/stove. Keep an emergency kit in your car with items like booster cables, shovel, bag of sand or cat litter. Complete list is at https://www.ready.gov/car. Have an emergency supply kit in your home available in the event of a power failure. https://www.ready.gov/build-a-kit. Check on your neighbors, especially the elderly and those living alone. Warming centers and shelters are available throughout Milwaukee County. If you are in need of shelter, heating assistance, or warm clothing, call 211 for assistance or visit Impact’s website at http://www.impactinc.org/impact-2-1-1/ for more information. January 22-27, 2019 is National Drug and Alcohol Facts Week (NDAFW). NDAFW links teens with scientists and other experts to counteract the myths about drugs and alcohol that they get from the internet, social media, TV, movies, music or from friends. The Milwaukee County Behavioral Health Division leads a community-wide prevention committee called Light & Unite Red (LUR). Red represents substance abuse awareness, and LUR members work together to shine a spotlight on the dangers of substance use. LUR members plan events throughout the year but focus on NDAFW. Learn about activities occurring around Southeastern Wisconsin this week at https://county.milwaukee.gov/EN/DHHS/BHD/Light-Unite-Red, follow LUR on Facebook at https://www.facebook.com/LightUniteRed, and take the interactive National Drug & Alcohol IQ Challenge quiz at https://teens.drugabuse.gov/quiz/national-drug-alcohol-facts-week/take-iq-challenge/2019. As part of the community health improvement cycle, the North Shore Health Department is currently completing the 2019-2023 Community Health Improvement Plan. One of the CHIP focus areas, identified by data and community input is “Substance Free Living.” Notable data includes an increase in overdose deaths in the North Shore over the last decade (heroin almost 300%; prescription opioids over 50%). We are seeking partners to join an Action Team to assist in developing this portion of the CHIP. If you are interested in being a partner, contact Lori at: nshd@browndeerwi.orgor 414-371-2980. With aging can come increased mobility challenges, especially when citizens are on certain medications and/or live in wintry climates like Wisconsin. Completing an individualized mobility plan, such as the one recently released by the CDC can help older adults plan for mobility changes similar to the way that many plan financially for retirement. The MyMobility Plan provides resources and tips for older adults to help maintain mobility, make their homes safer to prevent falls, and consider alternative transportation options as they age so they can stay safe, mobile, and independent longer. January is Radon Action Month. Radon is a naturally occurring, tasteless, odorless radioactive gas that is present in the ground. Radon is the second leading cause of lung cancer after cigarette smoking. Smoking combined with radon exposure poses additional lifetime risks of developing lung cancer. Radon gas forms when certain radioactive metals like uranium, thorium, or radium break down in rocks, soil and groundwater. The gas can enter your home through the foundation. One out of ten homes in Wisconsin has a high radon level. Radon levels vary from home to home, even in the same community. Having your home tested is the only effective way to determine whether you and your family are at risk of high radon exposure. Protect yourself and your family this month by testing your home with a radon testing kit. The North Shore Health Department would like to welcome Chris Cordova! Chris is a new public health nurse who recently joined the team! Chris is a resident of Fox Point and previously worked as a Research Nurse Coordinator at Washington University in St. Louis. Please feel free to stop in, say hi, and introduce yourself! For many Americans, the end of the year brings images of happy families celebrating holiday traditions, shared dinners, seasonal music, and cozy fires. For others, the holidays can be a much more difficult time – a time of family conflict, financial strain, loneliness, grief, and seasonal affective disorder. If you find the holidays tough, you are certainly not alone. Studies show that cases of depression and drunk driving crashes both increase during the holiday period. Unfortunately, many of these are tied to alcohol and drug abuse, typically engaged in by people who are trying to cope with holiday blues. If you or someone you know are struggling with alcohol or drug use/abuse, the Wisconsin Department of Health Services (DHS) has launched a new initiative to make it easier to find help: the Wisconsin Addiction Recovery Helpline. Staffed by trained information and referral specialists, the free and confidential Helpline is available 24 hours a day, seven days a week, and connects residents with local resources using a database of both public and private programs. Call 2-1-1, text your zip code to 898211, or visit www.AddictionHelpWI.org for more information or to search for providers. It’s not easy playing the part of host or hostess with the “most-est” at the holidays. A lot of time, effort, and planning goes into making merry with family and friends. In all the excitement of getting the house and food ready for guests, honest mistakes, minor mishaps, and even life-threatening emergencies can happen. Some accidents are just that—accidents—while others (like turkey fryer fires) are often preventable. However, you can be better prepared for all of them. Here are five do-it-yourself skills that will, at the least, save your guests from a mild bout of food poisoning. At most, they could save a life. Wet. Lather. Scrub. Rinse. Dry. Handwashing involves five simple and effective steps to reduce the spread of germs, including those that cause food poisoning. Don’t get “done” in. The term “doneness” refers to the outward appearance of food and has nothing to do with whether a turkey, for example, has reached a safe internal temperature. The only way to know that is to take its temperature. Learn how to use and correctly read a food thermometer to make sure food reaches a temperature hot enough to kill germs. Batteries not included. Batteries are not only a staple of holiday gift-giving for all those new electronics, but also necessary for home safety and preparedness. Know how to check and replace the batteries in your smoke alarms and carbon monoxide detectors. Make it a point to try yours before the guests arrive! Where there’s smoke… Holiday decorations can increase your risk for a home fire. Switch to flameless candles if possible. Never leave lit candles unattended and always keep them at least 12 inches away from anything flammable. Maintain and know how to use a home fire extinguisher just in case you need it. Choked up. Know how to help someone who is choking. Learn the Heimlich maneuver—a basic life-saving skill that anyone can learn and teach to others. According to the Wisconsin Department of Health Services, eight percent of Wisconsin residents have asthma. Milwaukee County has the highest rate of asthma-related emergency department visits in Wisconsin. Asthma is a chronic disease that can be managed with lifestyle changes and medication. Asthma causes episodes of wheezing, breathlessness, chest tightness, and nighttime or early morning coughing. Common triggers for asthma symptoms include air pollution, pollen, pet dander and smoking. For some individuals, cold weather can trigger asthma symptoms. Cold air causes the lungs to become inflamed and fill with mucus, causing breathing difficulties. 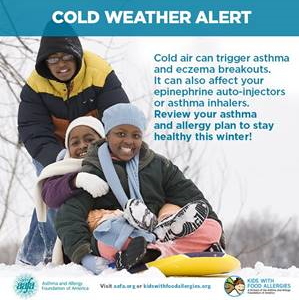 If your asthma symptoms worsen in winter, talk to your doctor about adjusting your medication plan for these months. Wear a scarf loosely over your nose and mouth and try to breath in through your nose, giving the air you breathe a chance to warm and humidify. If your asthma is under control you should not experience any symptoms, even on the coldest days. Regularly review your asthma action plan with your doctor to make sure to effectively control your asthma during all times of the year. It’s not too late to get vaccinated! December 2nd-8th is National Influenza Vaccination week. Just in time for family and friends gathering for the holidays, flu activity is increasing. Get a flu vaccine now if you have not gotten vaccinated yet this season. There are many reasons to get a flu vaccine. Getting vaccinated isn’t just about keeping you healthy; it’s also about helping protect others around you who may be vulnerable to becoming very sick, such as babies, older adults, and pregnant women. Remember that it takes about two weeks after being immunized for your body to develop sufficient antibodies to protect you. Fit in your immunization before holiday gatherings. For the most up-to-date information on pricing, upcoming clinics and screenings, visit the Clinics page of our website at: http://www.nshealthdept.org/Clinics and call us at 414-371-2980 to schedule your appointment today. Winter driving brings unique challenges for all, but if you have new teen drivers, this week may bring their first chance to drive in the snow or ice. Here are some winter driving tips for new drivers, that also serve as good reminders for the rest of us. Take extra time—to get to your destination, to stop, to turn, or to get started. Reduce speed, and increase following and braking distance. 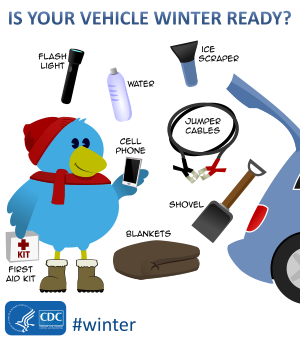 Make sure the car is winter-ready. Keep your fuel tank at least half full to prevent freezing of fuel lines and provide necessary fuel if you become stranded. Ensure your tires have good tread and are properly inflated. Ensure your battery, anti-freeze and cooling system are in good condition. Replace worn windshield wipers and carry extra washer fluid. Ensure headlights and other vehicle lights are operating properly. Before driving, clear snow and ice from the windows, lights, hood and roof. Don’t invite illness to your Thanksgiving table! The Thanksgiving meal is the largest meal many people prepare each year. Food handling errors and inadequate cooking are the most common problems that lead to foodborne disease outbreaks. Follow some of these helpful tips. Wash your hands for 20 seconds with warm water and soap before starting food preparation and between preparing different foods. That’s about the time it takes to sing Happy Birthday to yourself. Foods that can spoil or grow bacteria should be kept cold (under 41 degrees). Once foods are cooked, keep them hot (above 135 degrees). If foods cannot be kept under 41 degrees or above 135 degrees, keep at room temperature no more than four hours. After that, they need to be thrown out. When re-heating leftovers, make sure foods reach 165 degrees. If possible, use different cutting boards for fruits and vegetables versus raw meat. If you only have one cutting board, wash it with soap after each use, especially after preparing raw meat. Never thaw or defrost food at room temperature. Instead, plan ahead and place foods in the refrigerator a few days before your gathering. You can also thaw foods in the microwave, or by putting the food under cold running water; do not leave foods in submerged water, as this promotes bacteria growth. Properly cook meats to the recommended temperatures: poultry, stuffed meat, and leftovers should be cooked to 165 degrees; ground beef to 155 degrees; and fish, pork, and eggs to 145 degrees. November 15, 2018 is the American Cancer Society’s 43rd annual Great American Smokeout. The Great American Smokeout encourages smokers to make a plan to quit smoking. The most recent data available indicates that in 2017, 14.0% of U.S. adults were current cigarette smokers, the lowest prevalence recorded since monitoring began in 1965. Nonetheless, smoking remains the leading preventable cause of disease, disability, and death in the United States. Each year, an estimated 480,000 U.S. adults die from cigarette smoking and secondhand smoke exposure. Smokers can and do quit smoking: former smokers now outnumber current smokers! Among current U.S. adult smokers, nearly two out of three want to quit smoking, and about half made an attempt to quit in the preceding year. Medication and counseling/coaching are the two best tools to help you quit smoking—nearly tripling the likelihood of successfully quitting. You can get both FREE by calling the Wisconsin Tobacco Quit Line at 800-QUIT-NOW (800-784-8669). The Quit Line offers a free two-weekly supply of your choice of the nicotine patch, lozenge or gum, along with free telephone coaching on how to quit from experts. CDC’s Tips From Former Smokers campaign offers additional resources (https://www.cdc.gov/tips). Let this year’s Great American Smokeout event be your day to start your journey toward a smoke-free life. Now is the time to enroll in or change 2019 Marketplace health insurance. The 2019 Open Enrollment Period runs from Thursday, November 1, 2018, to Saturday, December 15, 2018. The Health Insurance Marketplace is for people who don't have health insurance coverage through a job, Medicare, Medicaid, the Children's Health Insurance Program (CHIP), or another source that provides qualifying health coverage. You can sign up for health insurance on your state's health insurance exchange or individual marketplace only during the annual open enrollment period, unless you have a "qualifying life event," such as getting married or having a baby. If you take no action, you will be automatically re-enrolled in your current policy. If you buy health insurance through your workplace, your employer will inform you about its open enrollment period. If you want to keep your doctors, make sure that they still participate in the plans you’re considering. Check the provider lists on healthcare.gov, but also double check the provider list on the carrier’s website or contact your current provider directly. There is no penalty for not buying coverage in 2019. However, it is a good idea to have coverage if you can afford it to avoid catastrophic bills for any unexpected health issues that may arise. You may not enroll at will throughout the year, so waiting for a health issue before attempting to enroll is not an option. You have short term plan options. Traditionally, short-term plans have been used to bridge a coverage gap of a few months or less, but a new ruling suggests they can be adopted as a long-term solution and can be renewed for up to 36 months. These plans do have limitations beyond what the ACA insurers meet. Insurers can charge you more based on preexisting conditions or deny you coverage. November 4th, 2018 marks the end of daylight saving time--a time of year that many people look forward to. After all, an extra hour of sleep is a hard thing not to like. However, this one-hour change may have some negative effects when it comes to road safety. It’s easy to assume that with one additional hour of sleep, road users will be more alert and aware, but in actuality there is generally an increase in the average number of collisions during the late afternoon commute in the two weeks following the end of daylight saving time, compared to the two weeks prior to the change. This may be due to people staying up that extra hour at night, and then missing it the next morning. Driving in the dark is also a factor. During the spring and summer months, people generally get up and return home while the roads and highways are brighter and hazards are easier to see. When drivers, cyclists, and pedestrians have spent the past eight months commuting in a well-lit setting, it may be hard to adjust for less daylight and poor weather conditions. Give yourself plenty of time to get where you want to go. Approach all crosswalks, intersections and transit stops with caution, as it will be harder to see pedestrians and cyclists. Maintain a safe following distance so you’re prepared to react under any situation. Rolling back the clock may sound like a great opportunity to stay up later; however, the time change can impact the quality of your sleep and affect your body’s internal clock. Whether you’re walking, cycling or driving, take advantage of the extra hour, sleep well, and be proactive on the road as the days get shorter. National Prescription Drug Take-Back Day is Saturday, October 27, 2018 from 10:00 a.m. - 2:00 p.m. National Take-Back Day is a safe, convenient, and responsible way to dispose of unused or expired prescription drugs. According to the 2016 National Survey on Drug Use and Health, 6.2 million Americans misused controlled prescription drugs. The study shows that a majority of abused prescription drugs were obtained from family and friends, often from the home medicine cabinet. Too often, unused prescription drugs find their way into the wrong hands. That's dangerous and often tragic. That is why it is important to get rid of unused medication! You can help prevent prescription drug abuse by talking to your children about the dangers of taking someone else’s medication, and by safely removing all expired and unused medications from your home. Incorrect disposal of some medications can affect aquatic plants and animals, contaminate our food and water supplies, or permit drug theft. For that reason, it is not recommended to flush or throw away any medications. Returning your unwanted medicine to a take-back program is the safest and most environmentally protective way to dispose of them. October is National Protect Your Hearing Month, a time to raise awareness about noise-induced hearing loss (NIHL) and steps you can take to prevent it. Loud noises can cause permanent hearing loss. Once hearing is gone, you can’t get it back. Hearing loss from loud noise can be prevented. About 70% of people exposed to loud noise never or seldom wear hearing protection. Repeated exposure to loud noise over the years can damage your hearing—even long after exposure has stopped. Everyday sounds typically do not damage your hearing. However, many people participate in activities that produce harmful sound levels, such as attending loud sporting events and music concerts and using power tools. Loud sound can damage sensitive parts of the ear, causing hearing loss, ringing or buzzing in the ear and increased sensitivity to sound. Repeated exposure to loud noise over the years affects how well you hear later in life and how quickly you develop hearing problems. · Turn down the volume of the TV, radio, or music. · If listening to loud music, take listening breaks to reduce your exposure. · Use quieter products (power tools, toys, recreational vehicles) whenever they are available. · Reduce equipment noise by replacing worn, loose, or unbalanced machine parts. Keep equipment well lubricated and maintained. · Use hearing protection devices (such as earplugs and earmuffs) when you cannot avoid loud sounds. · Make hearing protection convenient. Stash earplugs in your car or workshop for easy access. · Keep children away from loud music or equipment at home. 1. Place your baby on his or her back for all sleep times—for naps and at night. Babies who sleep on their backs are much less likely to die of SIDS than babies who sleep on their sides or stomachs. 2. Use a firm sleep surface, such as a mattress in a safety-approved crib or bassinet, covered only by a fitted sheet. Soft surfaces can increase the risk of sleep-related death. A firm sleep surface helps reduce the risk of SIDS and suffocation. 3. No bed sharing! Accidental suffocation, strangulation, and wedging (for example, being stuck between two objects such as a mattress and a wall) can happen when a baby is sleeping in an adult bed or other unsafe sleep surfaces. Room sharing is much safer than bed sharing and may decrease the risk of SIDS by as much as 50%. 4. Keep soft objects, such as pillows and loose bedding out of your baby’s sleep area. Soft objects and loose bedding, like stuffed toys, sheets, comforters, and blankets, can increase the risk of suffocation and other sleep-related deaths. If you’re worried about your baby getting cold while sleeping, you can dress her or him in sleep clothing (like a wearable blanket) to keep warm. 5. Do not allow smoking around your baby. Smoke in the baby’s surroundings is a major risk factor for SIDS. Quitting smoking can be hard, but it is one of the best ways parents and caregivers can protect their health and their baby’s health. 6. Alcohol and drug use is a risk factor for SIDS. Alcohol and drug use alters the way someone thinks and decreases parent’s arousal. This can cause parents to make decision about the babies sleeping position that are not safe. One of the most important jobs you have as a parent is keeping your child safe when riding in a vehicle. Each year, thousands of young children are killed or injured in car crashes. Proper use of car safety seats helps keep children safe. But with so many different seats on the market, many parents find this task overwhelming. If you are expectant parents, give yourselves enough time to learn how to properly install the car safety seat in your car before your baby is born to ensure a safe ride home from the hospital. The American Academy of Pediatrics recently released an updated version of its car seat safety recommendations for rear facing car seats. Remember that laws are based on ages, but safety guidelines are based on your child’s weight and height, which may or may not coincide with ages. Rear-facing car seat: Until they reach the seat’s height and weight limits. For the best possible protection, infants and toddlers should be buckled in a rear-facing car seat, in the back seat, until they reach the upper weight or height limits of their seat. Forward-facing car seat: After outgrowing rear-facing seat until they reach the seat’s height and weight limits (usually until at least age 5). When children outgrow their rear-facing seats, they should be buckled in a forward-facing car seat, in the back seat, until they reach the upper weight or height limit of their seat. Once children outgrow their forward-facing seat, they should be buckled in a belt positioning booster seat until seat belts fit properly. Children no longer need to use a booster seat once the seat belt fits them properly. Seat belts fit properly when the lap belt lays across the upper thighs (not the stomach) and the shoulder belt lays across the chest (not the neck). Proper seat belt fit usually occurs when children are about 4 feet 9 inches tall and age 9-12 years. Some seats in vehicles are deeper than others, so a child may fit in one seat location, but not another. For the best possible protection, keep children properly buckled in the back seat. Check the seat’s owner’s manual and/or labels on the seats for weight and height limits. Flu season is here, and it is time to get vaccinated! The 2017–18 influenza season in Wisconsin was extremely severe. Over 7,500 influenza-related hospitalizations were reported in Wisconsin, of which 65% were among people over 65 years old. More than 500 respiratory outbreaks, most of which were caused by influenza, were reported by nursing homes, assisted living facilities, and residential care apartment complexes. The number of influenza-associated hospitalizations and outbreaks was more than double that of any previous season. • Cover your mouth and nose when you cough or sneeze. • Wash your hands—especially before eating and after coughing, sneezing or blowing your nose. Last week, the City of Milwaukee had its first case of human West Nile Virus (WNV) in 2018. WNV is most commonly transmitted to humans by mosquitoes. Mosquitoes become infected when they feed on infected birds. Infected mosquitoes can then spread the virus to humans and other animals. Fortunately, most people infected with WNV will have no symptoms. About 1 in 5 people who are infected will develop a fever with other symptoms, while less than 1% of infected people develop a serious, sometimes fatal, neurologic illness. Symptoms of severe illness include high fever, headache, neck stiffness, stupor, disorientation, coma, tremors, convulsions, muscle weakness, vision loss, numbness and paralysis. While serious illness can occur in people of any age, those over 60 years of age are at the greatest risk for severe disease. People with certain medical conditions, such as cancer, diabetes, hypertension, kidney disease, and people who have received organ transplants, are also at greater risk for serious illness. • Limit time spent outside at dawn and dusk, when mosquitoes are most active. • Apply insect repellant to clothing as well as exposed skin since mosquitoes may bite through clothing. • Properly dispose of items that hold water, such as tin cans, plastic containers, ceramic pots, or discarded tires. • Change the water in birdbaths and pet dishes at least every three days. Oral health not only affects our ability to speak, smile, eat, and show emotions, but it also affects self-esteem, school performance, and attendance at work and school. Cavities (also called tooth decay) are one of the most common chronic diseases in the United States. Oral health has been linked with other chronic diseases, including diabetes and heart disease. Public health strategies such as community water fluoridation and school dental sealant programs have been proven to save money and prevent cavities. In the North Shore in 2015, 14% of adults surveyed indicated that they had unmet dental care in the last year—double the percent who reported unmet dental care in 2012. Tooth decay is the most common chronic disease among children in the United States. The Centers for Disease Control and Prevention (CDC) reports that more than 40 percent of children have decay by the time they reach kindergarten. It is important to catch and repair cavities early so that children are not in pain, which can impact their ability to eat, speak, and grow. We are busy preparing for flu season. Make plans now to get your flu immunization! Whether you have insurance or not, we can provide your flu immunization. Payment is in cash or check, or we can bill Medicare (card required). Call the office (414-371-2980) to check on availability of vaccines for specific clinics. September is National Preparedness Month (NPM). This year’s NPM focuses on planning, with the overarching theme “Disasters Happen. Prepare Now. Learn How.” When disasters occur, such as the recent flooding throughout Wisconsin, first responders are often overwhelmed with major rescue efforts and individuals need to ensure that they are prepared for immediate action. · Put together a plan by discussing these four questions with your family, friends or household to develop your emergency plan. o How will I receive emergency warnings? o What is my shelter plan? o What is my evacuation route? o What is my family/household communication plan? · Consider specific needs in your household (children, older adults, those with access and functional needs, special medical needs, dietary needs). · Fill out a family emergency plan. The Health Department has completed bacteria level testing of the North Shore beaches for the season. This summer Atwater reached the advisory level twice, Doctors Park reached advisory level once, and Klode reached advisory level four times and was closed once due to elevated bacteria levels. Signs indicating bacteria levels will be removed later this week. While warm weather and swimming may continue, remember heavy rains wash organisms into the water and can disturb sediment. This causes cloudy and potentially unhealthy conditions and could contribute to rip currents and undertows making swimming unsafe. Always practice cautious swimming habits and if in doubt, stay out! The Health Department is partnering with local and state health departments on investigations related to synthetic cannabinoids. Wisconsin continues to see cases of severe bleeding following the use of synthetic cannabinoids, often called “fake weed,” “K2,” and “spice.” The bleeding occurs as these products contain rat poison (brodifacoum). Overall, Wisconsin has seen 54 cases since March of this year. Counties with confirmed cases include Dane, Milwaukee, Outagamie, and Rock. People should call 911 or immediately go to an emergency room if they or someone they know are experiencing a serious reaction to synthetic cannabinoids. · Tightly cover water storage containers (buckets, cisterns, rain barrels) so that mosquitoes cannot get inside to lay eggs. · For containers without lids, cover with wire mesh with holes smaller than an adult mosquito. · Use larvicides to treat large containers of water that will not be used for drinking and cannot be covered or dumped out. · If you have a septic tank, repair cracks or gaps. Cover open vent or plumbing pipes with wire mesh with holes smaller than an adult mosquito. · If you have a pool, keep the filter running, which keeps water moving and prevents mosquitoes from breeding. When closing the pool for the winter, keep it covered and properly winterized. · Use an outdoor insect spray made to kill mosquitoes in areas where they rest. · Mosquitoes rest in dark, humid areas like under patio furniture, or under the garage. · When using insecticides, always follow label instructions. August is National Immunization Awareness Month. Immunization saves millions of lives and is widely recognized as one of the world’s most successful and cost-effective health interventions. Immunizations have positively impacted the lives of infants, children and adults. Vaccination is very safe and effective. Vaccines are only given after a long and careful review by scientists, doctors, and healthcare professionals. Immunization protects others you care about and the community. Immunizing individual children helps to protect those people who cannot be immunized (children who are too young to be vaccinated, or those who can’t receive certain vaccines for medical reasons), and the small proportion of people who don’t respond to a particular vaccine. Immunizations can save your family time and money. A child with a vaccine-preventable disease can be denied attendance at schools or child care facilities. Some vaccine-preventable diseases can result in prolonged disabilities and can take a financial toll because of lost time at work and medical bills. The North Shore Health Department prevents vaccine-preventable diseases through our Immunization Program. Immunizations are provided to uninsured, underinsured and, in limited cases for some vaccines, private payers. Additionally, the health department provides education and outreach to residents, healthcare providers, school nurses, media, and others on the epidemiology of vaccine-preventable diseases and current vaccine recommendations. September is National Childhood Obesity Awareness Month. About 1 in 6 children in the United States has obesity. Certain groups of children are more affected than others. Children with obesity are at higher risk for having other chronic health conditions and diseases, such as asthma, sleep apnea, bone and joint problems, and type 2 diabetes. They also have more risk factors for heart disease like high blood pressure and high cholesterol than their normal weight peers. Children with obesity can be bullied and teased more than their normal weight peers. They are also more likely to suffer from social isolation, depression, and lower self-esteem. Providing nutritious, lower-calorie foods such as fruits and vegetables in place of foods high in added sugars and solid fats. Try serving more fruit and vegetables at meals and as snacks. Making sure drinking water is always available as a no-calorie alternative to sugary beverages and limit juice intake. Be a role model! Eat healthy meals and snacks and get the right amount of physical activity every day. The North Shore Health Department participates in a variety of community events throughout the summer including: National Night Out, Safety Days, Farmers’ Markets, Car Seat events, and many more. Community events build cohesion and resiliency among residents, businesses, government and community groups to make communities and neighborhoods safe and free of crime and violence. Community cohesion is the coming together of people with a shared vision and sense of belonging in which the diversity of people’s backgrounds and circumstances are valued and appreciated. Community resilience is the sustained ability of a community to utilize available resources to respond to, withstand and recover from adverse situations. Both community cohesion and resiliency are important elements in a safe and healthy community and are fostered through fun events and activities involving the whole community. Earlier this summer we participated in Farmers’ Markets in Fox Point and Brown Deer and last week we participated in Glendale’s National Night Out. In September we will be at the Bayside Picnic on September 8th, Shorewood Farmers’ Market on September 15th and Whitefish Bay’s Farmers’ Market on September 22nd. Earlier this spring, Sanja Miljevic, one of the NSHD’s four Public Health Nurses, won the Carol Graham Scholarship for Emerging Leaders in Public Health Nursing. As an award recipient Sanja received a paid registration to the Wisconsin Public Health Association’s Public Health in Practice Conference. Sanja attended the conference in Stevens Point last week to develop her skills and learn of resources to improve community health. Sanja has been with the NSHD for four years and in that time has become one of our primary nurses working on communicable disease investigations, including managing several active TB patients. In her time with the Department, she has become a certified Child Passenger Safety Technician and a Rabies Control Program Trained Observer. Sanja also helped develop and onboard staff to our new scheduling and billing software system, allowing us to expand our Medicare billing options for flu vaccine. Congratulations, Sanja, on your award and your achievements in public health. 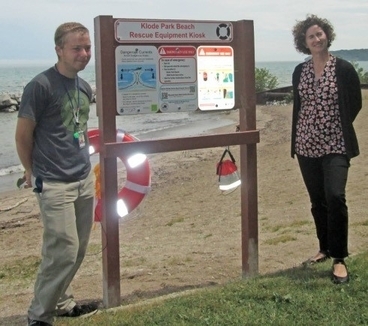 The North Shore Health Department receives a grant from the Wisconsin Department of Natural Resources (DNR), through the US Environmental Protection Agency (EPA) to conduct beach monitoring for presence of E. coli at the three Lake Michigan beaches in our area—Atwater in Shorewood, Klode in Whitefish Bay, and Doctors in Bayside. We work with the Shorewood DPW and the North Shore Water Commission to test water at least twice a week. Signs are posted at each beach, indicating whether a beach is open (green), closed (red) or has elevated levels of E. coli detected (yellow). Current status of E. coli levels in most Wisconsin beaches, including the North Shore beaches, is available at: https://www.wibeaches.us. In 2017, two drownings occurred on North Shore beaches. Seeing a need for more urgent response and rescue equipment, a Whitefish Bay resident, 17-year-old Matthew Pomes, worked in conjunction with the North Shore Health Department and the Village of Whitefish Bay to design and install a beach rescue equipment kiosk at Klode Beach for his Eagle Scout project. Congratulations, Matthew, and thank you for helping make Klode Beach a safer place to swim! Last Thursday the North Shore Health Department hosted a Community Conversation at the Schlitz Audubon Nature Center to help us in developing the North Shore Community Health Improvement Plan (CHIP). We had a great turnout and many suggestions for us to integrate into the CHIP. The North Shore Health Department will be hosting a Health and Well-Being Community Conversation at the Schlitz Audubon Nature Center. Stop by between 3:00-6:30pm on Thursday, July 26, to prioritize community health issues and action steps for the North Shore Health Improvement Plan. Please register online at http://ow.ly/QkMn30kEWII or by calling (414) 371-2980. The North Shore Health Department reports a dead crow found in Milwaukee County has tested positive for West Nile virus. West Nile virus is spread to humans through the bite of an infected mosquito. Mosquitoes acquire the virus by feeding on infected birds. The majority of people (80%) who are infected with West Nile virus do not get sick. Those who do become ill usually experience mild symptoms such as fever, headache, muscle ache, rash, and fatigue. Less than 1% of people infected with the virus get seriously ill with symptoms that include high fever, muscle weakness, stiff neck, disorientation, mental confusion, tremors, confusion, paralysis, and coma. Older adults and those with compromised immune systems are at greater risk of developing central nervous system illness that can be fatal. The Wisconsin Department of Health Services will continue surveillance for West Nile virus until the end of the mosquito season. To report a sick or dead crow, blue jay, or raven, please call the Dead Bird Reporting Hotline at 1-800-433-1610. The North Shore Health Department is hosting our first broad community discussion to help us in developing the North Shore Community Health Improvement Plan. The CHIP is a 5-year plan that identifies health priorities, develops and implements strategies to address the priorities, and lays out the means to measure health improvements. Please consider joining us on Thursday, July 26th, 2018 at the Schlitz Audubon Nature Center where we will review the community health issues that emerged from the North Shore Community Health Assessment and discuss potential action steps for improvement. We invite you to stop by anytime between 3:00pm – 6:30pm to meet with stakeholders and staff, review the potential topic areas, and provide input on what is being or could be done to make our communities healthier and safer. If you can’t join the discussion on July 26th, please let us know as there will be other opportunities to provide input and get involved. The event is free, but we would like everyone to register through the link on our website (https://nshealthdept.org). The North Shore Health Department investigates several tickborne infections including Lyme disease, babesiosis, ehrlichiosis, anaplasmosis, and rocky mountain spotted fever. Lyme disease is the most frequently reported tickborne illness in Wisconsin, but numbers for the other conditions are increasing. Common symptoms of tickborne diseases may include fever, chills, muscle aches, headache and rash. Preventing tick bites is the key to reducing your risk of tickborne diseases. Avoid areas with tall grass and brush where ticks are common. Apply repellents that contain at least 20%–30% DEET. Wear clothing treated with 0.5% permethrin. Shower soon after coming indoors. Perform daily checks. Check your entire body after being outside even if you were only in your yard. It is important to remember that ticks are present in all counties in Wisconsin. People living in any county in Wisconsin can contract Lyme disease or other tick-borne diseases. Summer is in full swing and Fourth of July is here! As you celebrate with friends and family this week, it is important to remember some key safety tips about the use of fireworks. According to the US Consumer Product Safety Commission, 280 people on average go the emergency room every day with fireworks-related injuries in the month around the July 4th holiday. Per the North Shore Fire Department, sparklers, smoke bombs and snakes are the only fireworks that have been identified as legal in the State of Wisconsin and the North Shore.